Well, having solved some of my bandwidth issues (now I have 60Gb monthly limit!) 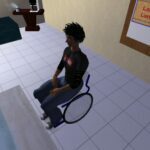 I have been able to better use my time in Second Life and really started to establish a presence. SL is a real bandwidth slurper. Like many newbies I wandered aimlessly around the SL world seeing what I could see, and trying to make sense of the things I could touch. In Second Life, as in First Life, not everything is as it appears. I found myself falling foul of pranksters who offer freebies that have embarrassing little scripts attached. I finally secured some land (well I have a loan of some land under the Campus: Second Life program. I might have to look into establishing an educational consortium to buy an entire island – perhaps WUGPWA will be interested. I’ve set up home on the corner of my parcel of land – I have great views and a nice work space and living area. I have flat screen panels that stream video and news updates to me as well as great little conversation area and a huge rug on the floor to relax with friends. Upstairs is a lounge and outdoor setting. Way up in the sky is a Skybox where friends can meet and play with their appearance or try out new objects. I’ve a big empty building that I’m hoping will be used as small auditorium for presentations (might have to reduce the number of prims in use on the parcel though). Down the other end of my block is a nice little gazebo and a duck pond. There are a few water features and some plant and animal life. The weather is still unpredictable. A crackling fireplace, some music upstairs, an annoyingly chatty parrot make it seem both more peaceful and chaotic. I’ve started to modify scripts and can play about with the appearance of existing objects – including adding scripts and new textures. My skills in building from scratch are a bit rudimentary – but I think given time I might come to grips with it all. Presently my space is quite realistic in appearance and that’s something I might want to change over time as come to understand the possibilities of new metaphors. Why go to a virtual world and recreate the real world – I suppose mainstream theatre and film also fall into the same pattern. My space has started to come alive for me – and people are dropping by to visit. My list of friends is growing and I’m getting more invitations to interesting events. The purchase of my new computer recently has given me the ability to email to and from my work space in Second Life.